In keeping with their goals to stop proposed tolling on Interstate 95, leaders of the No Tolls I-95 Coalition recently met with Federal Highway Administrator Victor Mendez in Washington. RALEIGH - The prospect of paying $20 tolls to drive Interstate 95 through North Carolina has brought potentially fatal opposition to the idea from state and federal lawmakers. RALEIGH — Legislators on both sides of the aisle, and both sides of Interstate 95, are throwing roadblocks in front of a thoroughly unpopular proposal from the state Department of Transportation to finance a $4.4 billion widening project by collecting tolls from I-95 drivers. WASHINGTON, DC – U.S. Rep. G. K. Butterfield, D-Wilson, introduced H.R. 5713, the Talk Before You Toll Act of 2012, which would ensure the North Carolina Department of Transportation and the Federal Highway Administration fully consider public opposition to tolling of Interstate 95 in North Carolina. Congressman G.K. Butterfield said he would introduce a bill called Talk Before You Toll. U.S. Rep. G.K. Butterfield, D-Wilson, unveiled a new bill today “The Talk Before You Toll Act of 2012” before members of the No Tolls on Interstate 95 Coalition. SMITHFIELD — Opponents of tolling Interstate 95 view the idea as leading to double taxation and increasing the cost of travel for North Carolinians already paying the sixth highest gas tax in the nation. 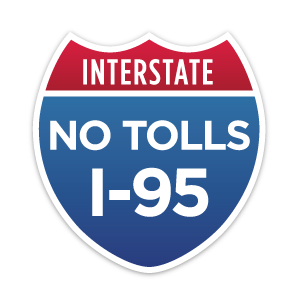 SMITHFIELD, NC -- The number of residents who oppose putting tolls on Interstate 95 is growing. WASHINGTON — The federal interstate highway system is showing its age, and, faced with the cost of repairing all those bumps and cracks, some states want to ask motorists to pay tolls on roads that used to be free.